Sturdy and durable in construction, the sleek and streamlined Blazer Pool Table keeps the focus on the purity of the game through it’s understated design and excellent playability. It’s affordable price makes it a top-level choice for a budget-minded game room design project. Call us today at (816) 279-6113. We’re looking forward to speaking with you! 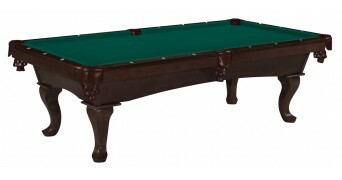 Legacy uses a fine furniture quality finish on all Legacy manufactured game tables and furniture items. Legacy not only designs each piece but manufactures and finishes each piece in their state of the art facility plant under tight Legacy quality controls. Please use this guide when choosing your finish, not every finish is available on all items. Legacy features game room products that allow you to match and coordinate our pool tables, shuffleboards and furnishings with your home design style to complete a perfect game room. All wood game room furniture products, shuffleboards and pool tables are finished with our quality controlled 14 step process finish. – Item is cleaned of any debris. – Wash coat (PU base AKZO) oven. – Base coat (PU base) oven. – Shading stain 100% color. – Add final top coat. 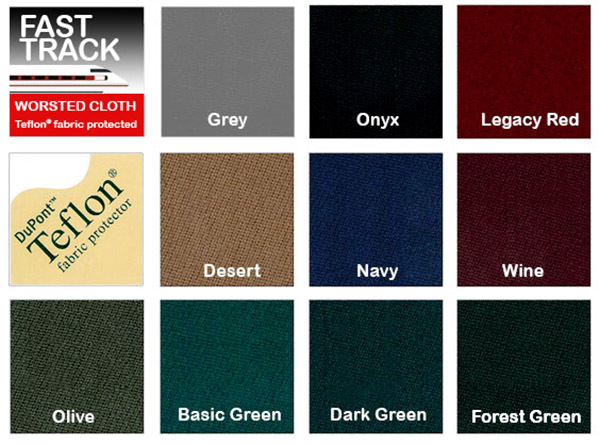 Legacy offers two types of cloth for use with our pool tables, Napped Wool or Worsted Wool. Both are made from wool and contain a percentage of nylon. Legacy Billiards recommends worsted wool because of it’s durability, speed, and easy maintenance. All Legacy pool tables include FREE Napped Cloth in a choice of four colors: napped desert, black, Legacy red and basic green. Napped cloth is woven with thread made up of long and short fibers twisted together to make billiard cloth with a fuzzy surface. Napped is less expensive and shows chalk marks less because of the thicker weave that allows the chalk dust to settle in the cloth. Napped cloth also tends to pill which slows the ball. Napped cloth is less durable. Post leg construction is designed so the panels are inserted in the legs. This allows the weight to be transferred directly to the legs and not rely on hardware to carry the weight of the slate. Fortress Power Rail (patent pending) with its 3/4″ laminated T-nut securely attach the rails to the table. Every pool table from Legacy Billiards comes with a free starter accessory kit. ACME Music and Vending Co. has been proudly serving in St. Joseph MO since 1938. ACME provides a full line of Amusement, Vending, and Office Coffee services to local and out of state businesses, bars, manufacturing plants, bowling centers, schools, and many other types of facilities. All vending and amusement equipment is installed and maintained by qualified technicians. These technicians are on call twenty four hours a day seven days a week. If any problem arises with the equipment our technicians usually respond to a service call within 30 minutes from which it is placed. © Copyrights 2015 ACME Music & Vending Co, Inc All rights reserved.